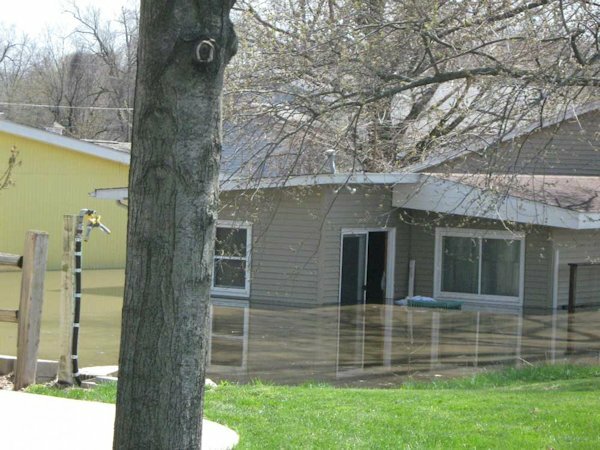 The most recent flood results in Henderson County can be attributed to precipitation from the north and northwest, according to Coral Seitz, Henderson County Emergency Management Director. Seitz noted that water level predictions from the National Weather Service made a jump of four feet in two hours. The actual levels came up five feet since Friday, April 19, 2013. 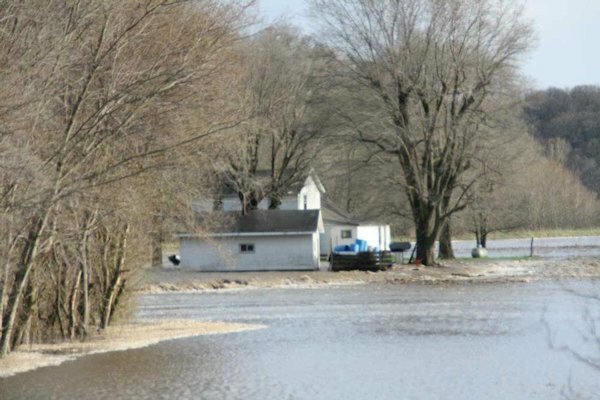 Six streets were closed off in Oquawka due to high water and eight homes were affected, three of these due to the breech in the levee, which occurred Sunday. Tuesday, in the middle of the night, crests were reported in Burlington at 22.26 feet. By 7 a.m. those had dropped to 21.7 feet. In Keithsburg, middle of the night crests on Tuesday were reported at 20.57 feet and by 7 a.m. dropped to 19.7 feet. 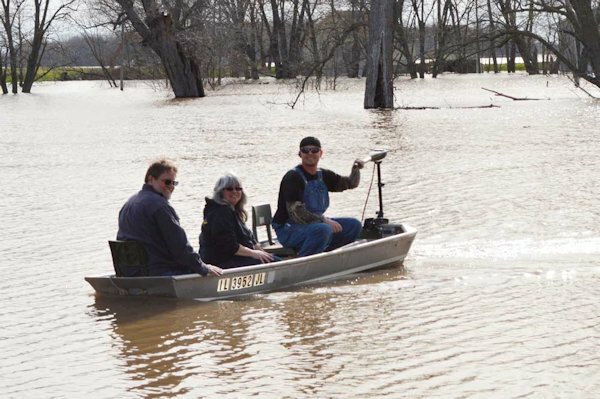 It was reported, by a spokesperson at the Henderson County Sheriff's Department, that these amounts should be down by a half of a foot by Wednesday, according to the Corps of Engineers. It was also noted that when the levee breeched it actually caused the pavement at the foot of Schuyler Street to be pushed up. Two businesses in Oquawka have also been directly affected by the flooding. The Oquawka Diner, known as the "Old Fish House" and the Oquawka Current have been closed by the flood. Scott Pullen was instrumental in helping to remove artifacts from the Oquawka Museum and Annex to a dryer location, as well as moving them to a second floor for protection. 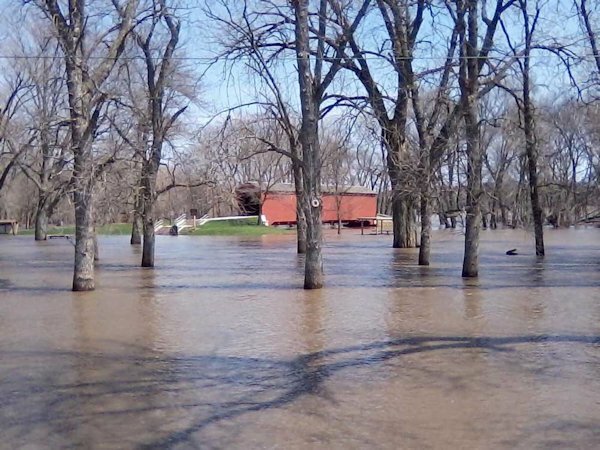 Seitz said that over the weekend, the flooding of Henderson Creek and Ellison Creek in Henderson County caused approximately 20 road closures in the county. 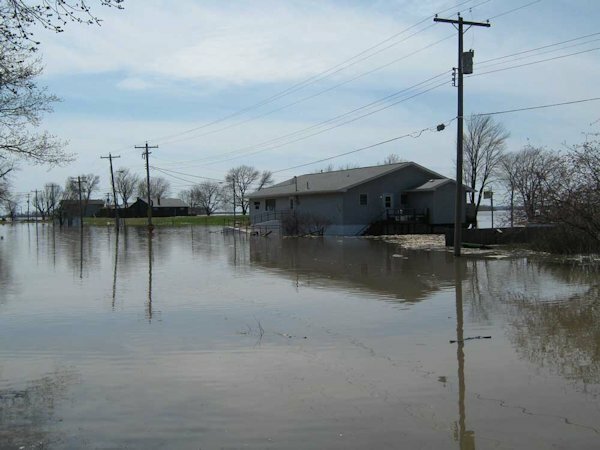 "There have been major flooding of fields between Gladstone and Oquawka," said Seitz. "The Carman Blacktop is down to one lane traffic between Heapsville and the Carman Cemetery," she noted. Seitz took this opportunity to remind people not to drive through standing water. "The currents are strong and the water may be filled with more contamination," she reported. It is important to note, said Seitz, "that the precipitation attributed to this flood was not from snow melt from the north." That may come later. She added that in 1993 and 2008, there were two floods in each of those years. There was a Spring flood early and in July 1993 and June 2008 record breaking floods occurred. River and lake statistics can be found at NOAA Quad Cities.